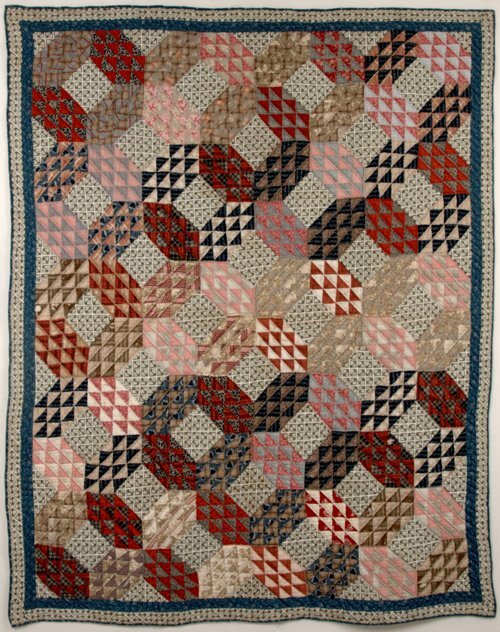 Quilt in the "Ocean Wave" pattern, made of red, blue, green, and brown calico prints. The quilt is hand pieced and quilted, with straight applied binding along the edges. Eliza (Hobart) Austin made the quilt in the 1880s. "Ocean Wave" was a particularly popular pattern from about 1870 until 1890. Eliza collected the scraps of fabric for several years while living in Illinois, Iowa, and Kansas. Born in Illinois in 1831, Eliza married Lucius Austin in 1852, and they had eleven children. The family lived in Illinois and Iowa before coming to Kansas. Austin died in 1928 in Mullinville, Kansas. Both Eliza and her sister Caroline were quilters; one of Caroline's quilts is also in the collections of the Kansas Museum of History.